Indian culture has a special liking for animals both for their mythological significance and faithful companionship. Animals, affectionately called animalitos, little animals, are frequently presented in nativities as shown in this set. Ignacia Saya Duran of Tesuque Pueblo works with micaceous clay, which gives to this scene, animated by tortoise, rabbit, snake, squirrel, lizard and bear, a scintillating quality. 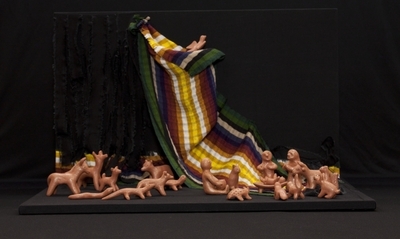 Clay figures depicting the nativity of Jesus, created in 1999 by Ignacia Saya Duran in the Tesuque Pueblo in New Mexico. Exhibition label originally written by Fr. Johann G. Roten, S.M. for exhibit held at Roesch Library, University of Dayton.